A looming grey morning by the river, mist whispering through the bent reeds and feather-ended grasses that wave, regally, breezily. Afar, a loose brush stroke of blue; a distant sun illuminating the lower Peaks flourescently; shining like a glint of silver on an old clock face. 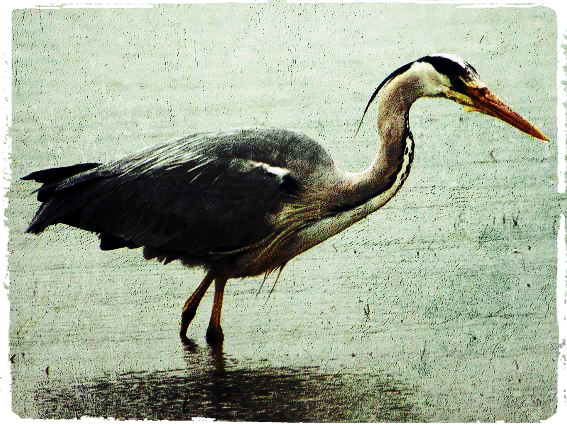 The longnix, the grey predator, stands stock still on the river bank. Her movements are imperceptible; geologic, intent-filled. Statuesque, she eyes a river rock pool, flush with bright gravel and water-oiled cobbles; previously I had seen her nestling under an overhanging tor worn smooth by the persistent, urgent caresses of the wind, in the long grass, hard staring the opal black water. She is the hunter. Not a lion or wolf, but an assassin; she steps in and becomes the shadows; her neck is a spear gun, flaring, darting, incisive. A starter pistol, an instant reaction. The stickleback’s back is snapped back; then broken, swallowed, gone. Disturbed; longnix is unruly, comical. The take-off strained; loping, curving, sagging; struggling to make altitude before at last she is away, wings spreading and eventual grace. Built for stillness or flight; the rest, awkward. Unawares, she transmutes into a champion cyclist; “il campionissimo”; thin limbed and lithe, knees knocking, walking like a baby giraffe or foal – best when still; then on the bike, the longnix stands, unfurls, opens up, wings spreading, takes off. Built for stillness or for flight, the rest, awkward.